This Cart Cooler features a polyester micro-fiber soft exterior construction, with an insulated 25-quart foil interior, plus a removable heat-sealed, water-resistant PVC liner that holds up to 15 quarts or 37 standard size beverage cans. 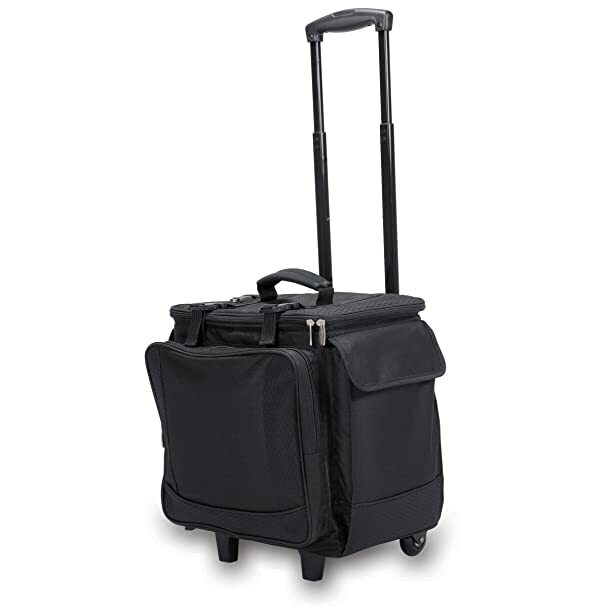 This removable cooler sits on a sturdy, lightweight folding trolley complete with extra wide wheels and a stability bar to keep the tote upright when not rolling. The cooler has a generous storage pocket on each side and a large zippered opening for easy accessibility, providing a convenient, effortless way to tote your goodies around in style. An adjustable split-level comfort-grip handle provides two handle heights for added comfort. 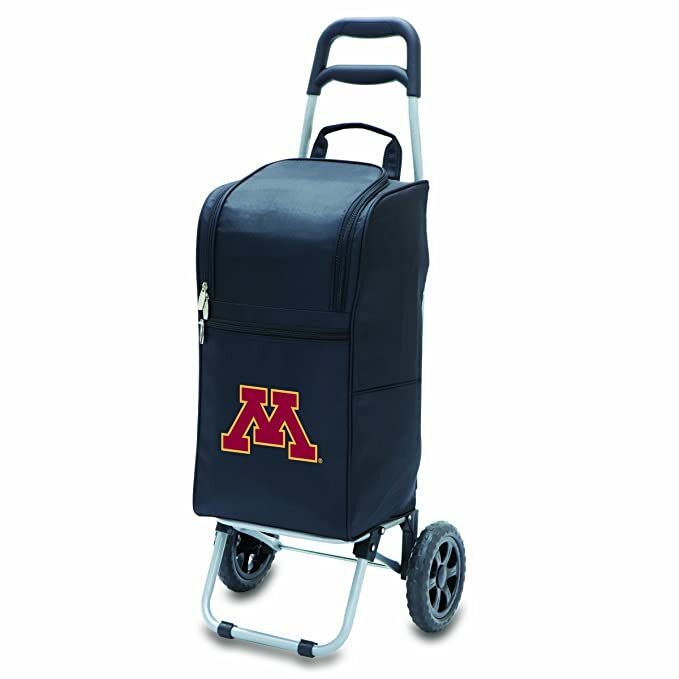 This versatile insulated cart cooler has your favorite team’s digital print logo, will handle up to 77 pounds and is perfect for picnics, trips to the beach or park, grocery shopping or a stroll through the farmers market. Perfect for picnics, outdoor concerts, or days at the beach, the Picnic Time Malibu insulated pack with deluxe picnic service for two features a sturdy polyester microfiber construction, an integrated fully insulated wine storage section along with a spacious food storage section with removable, water-resistant liner. The adjustable shoulder strap makes it easy and convenient to carry, or use the dual carry handles as another transport option. Included in this picnic set are 2 each: 8-ounce shatter-resistant wine glasses, 9-inch melamine plates, forks, knives and spoons, all stainless steel with plastic handles, 100 cotton napkins, plus a stainless steel waiter’s style corkscrew, a 6-inch square hardwood cutting board, and stainless steel cheese knife with wooden handle. The design has pockets and straps with Velcro that secure the accessories in place during transport. The Malibu makes an excellent gift. Measures 14.5 by 10.5 by 9 inches. Backed by the Picnic Time Family of Brands BUILT TO LAST Lifetime Guarantee. 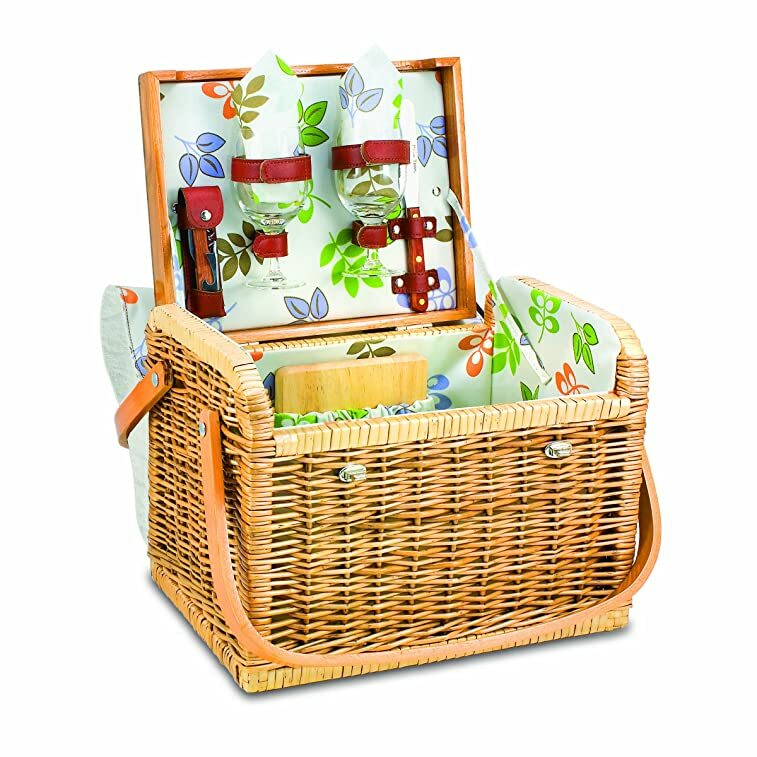 Perfect for wine tasting excursions, picnics in the park or day outings, the Picnic Time Kabrio picnic basket features sturdy willow construction with a soft insulated cover. Lift the canvas lid to reveal an integrated hinged wooden table top, the perfect flat surface for resting wine glasses or food items. Pull up the table top and inside you’ll find 2 each: hand-blown 7-ounce wine glasses, coordinating 14-inch 100 cotton napkins, plus a 6-inch hardwood cutting board, stainless steel cheese knife with wooden handle and stainless steel waiter-style corkscrew. The dual handles on the Kabrio fold down for access to the basket and the accessories are secured during transport with the handsome leatherette accent straps. 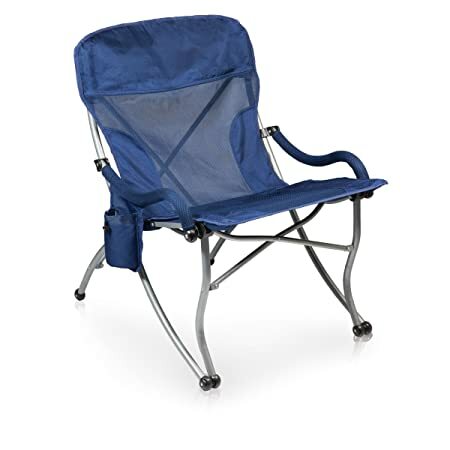 The Kabrio is perfect for outdoor concerts, happy hour at the beach or park, or road trips. Makes a fabulous gift! Measures 14.5 by 11 by 10 inches and is backed by the Picnic Time Family of Brands BUILT TO LAST Lifetime Guarantee. Lightweight steel frame. 300-denier polyester seat cover with large zipper pocket. Wide seat and backrest cushioned with foam. 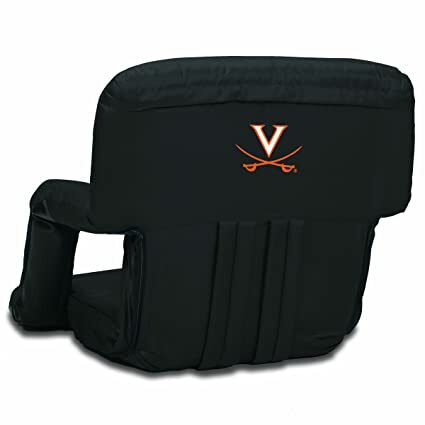 6 backrest positions and adjustable straps. Water-resistant reinforced bottom. Perfect for picnics, outdoor concerts, or days at the beach, this Meritage insulated tote by Legacy, a Picnic Time brand, features wine and cheese service for two, sturdy polyester canvas construction, an integrated wine storage section for two bottles of wine, along with a second storage section which holds the wine glasses, that can be converted to another wine bottle storage compartment. The padded, adjustable shoulder strap has a non-slip underside, making it easy and convenient to carry, and a single handle on the top offers an alternative transport option. 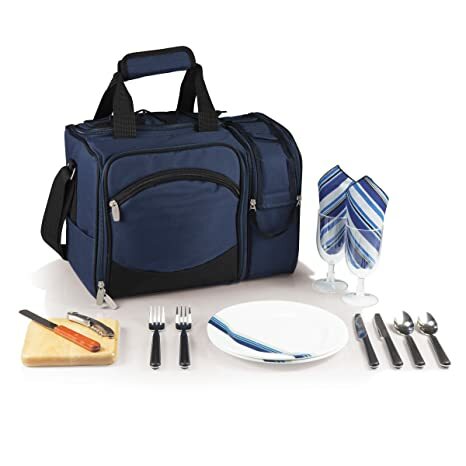 Upzip the front compartment to reveal the picnic components: two acrylic wine glasses, two cotton napkins, a 6-inch square wooden cutting board, stainless steel waiter’s style corkscrew, stainless steel cheese knife with wooden handle, and bottle stopper. The Meritage has a unique triangular shape and measures 19 by 15 by 13 inches. Backed by the Picnic Time Family of Brands BUILT TO LAST Lifetime Guarantee. 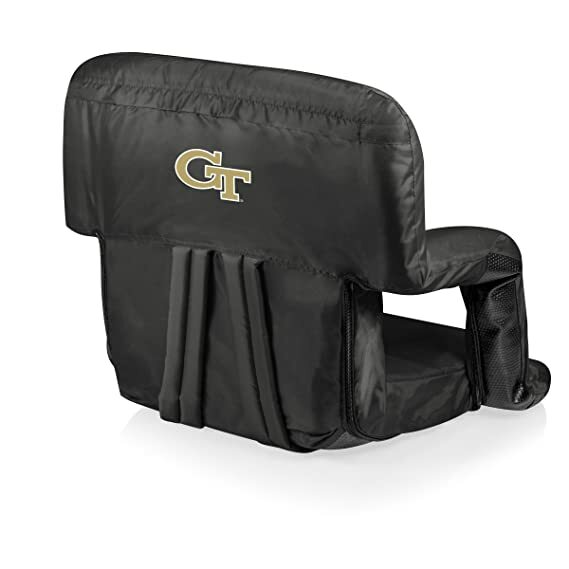 Show your team spirit with this Picnic Time Sports Chair, in your team colors with digital print team logo. 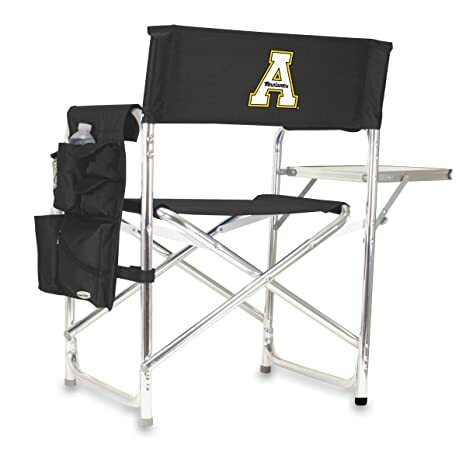 This lightweight and durable folding aluminum Sports Chair is perfect for outdoor leisure. In addition to being lightweight, a removable shoulder strap makes this chair very easy to carry. The extra-wide seat is made from durable 600D polyester, and has padded armrests, designed for optimum comfort. The large side flap has a velcro pocket for a cell phone, a velcro pocket for sunglasses, a large zipper pocket to hold valuables, and an insulated wine/water bottle holder (protected by ThermoGuard). A convenient side table folds out to hold food, drinks, and other belongings. 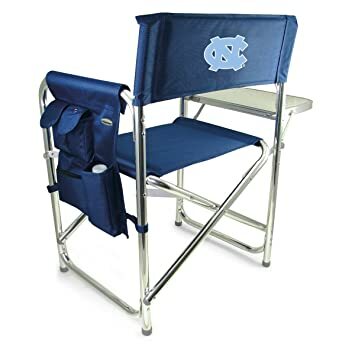 The sports chair makes an excellent gift! Perfect for wine tasting excursions, picnics, day outings, or outdoor concerts, the Picnic Time Napa basket features sturdy willow construction with premium leatherette straps and is fully-lined. The Napa basket comes with deluxe cheese and wine service for two, making this a great get-away basket for romantics. 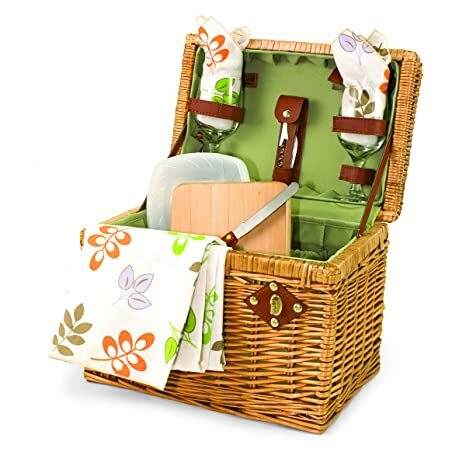 Included in this basket are two hand-blown 7-ounce wine glasses, two 14-inch 100 cotton napkins, a 6-inch hardwood cutting board, stainless steel waiter-style corkscrew with wooden handle, stainless steel cheese knife with wooden handle, food container and a coordinating 100 cotton tablecloth that measures 44 inches square. The handsome leatherette straps hold the components in place inside the basket for easy transport. The Napa makes an impressive gift and measures 12-1/2 by 10-1/2 by 8-1/2 inches. Backed by the Picnic Time Family of Brands BUILT TO LAST Lifetime Guarantee. This Picnic Time Botanica Kabrio wine basket is like no other wine basket you will find. Made of willow with a soft insulated cover, it features an integrated wooden table top, perfect for resting wine glasses or food items. It includes: two handblown 8-ounce wine glasses, two matching 100 cotton 14 x 14 napkins, one 6 x 6 hardwood cutting board, one stainless steel cheese knife with wooden handle, and one stainless steel waiter-style corkscrew. Take the Picnic Time Kabrio on your next romantic get-away! 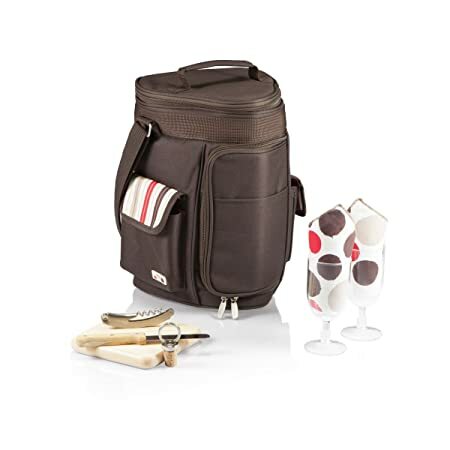 This Bodega insulated 12-bottle wine cooler tote with integrated trolley by Legacy, a Picnic Time brand, is perfect for wine tasting tours, picnics, or outdoor concerts. The Bodega features a telescopic handle with push-button release and three large exterior pockets to fit ring binders, books, brochures, magazines or other personal effects. There is also a small pocket on the top of the cooler that is perfect for storing a waiter’s style corkscrew. Unzip the interior bottle divider from the interior cooler compartment to reveal a water-resistant liner underneath that converts the wine tote to a 40-can capacity cooler. Made of polyester canvas with a heavy-duty comfort grip top handle and two locking clasps to secure its contents, you can be assured the Bodega will protect and insulate your best bottled beverages at just the right temperature while on the go. Measures 15 by 14.3 by 17.3 inches. Backed by the Picnic Time Family of Brands BUILT TO LAST Lifetime Guarantee.